Asus has unveiled four devices that run on an unannounced, not yet launched 6th generation Intel Core I-series Skylake processor, which comes after Broadwell. The first two are gaming workstations while the third is a mini PC, the VC65, which brings some exciting features like onboard RAID (which means it has space for two drives) and, from what we could gather on pictures, even a serial port. Its design is reminiscent of the Dell GX620 Ultra Small Form Factor from 10 years ago but with smoother curves and a VESA mount. Unlike many of its competitors, the PSU is built in, which has its advantages - such as reducing clutter but making it compulsory to send the part back if there's any power-related issues. The rest of the configuration is pretty enticing; you can connect at least four displays to it (one USB 3.0, one Display Port, one HDMI and one VGA), plus there's an Ethernet port, six USB 3.0 connectors and two audio ports. 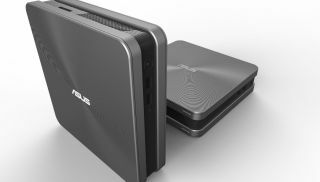 The fourth device to feature a Skylake, 6th generation Intel Core CPU is the VivoMini UH65H, which is Asus's take on Intel's NUC (next unit of computing). This one comes with an Iris Pro GPU and supports an M2 SSD and a 2.5-inch hard disk drive. There's also 802.11ac dual-band Wi-Fi and from what we could see from some blurry shots, four USB 3.0 ports, an Ethernet port, Display Port and HDMI as well as a SD card reader. Unlike the VC65, the PSU is likely to be outside.